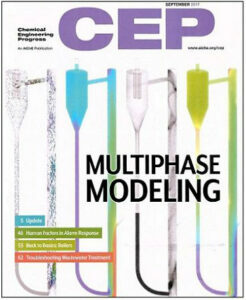 The multiphase flow artwork of Dr. Jordan Musser is featured on the cover of the September 2017 issue of Chemical Engineering Progress (CEP). CEP magazine is the flagship publication of the American Institute of Chemical Engineers (AIChE) and is distributed monthly to nearly 30 thousand professionals in chemical engineering fields, most of whom work in industry. The cover features an MFIX-DEM simulation of a laboratory-scale, chemically reacting, circulating fluidized bed showing full-loop profiles of particle positions and velocities and gas species concentrations. The September CEP issue also features an article by members of the CU-NREL-PSRI team introducing CFD-DEM and discussing results from a survey conducted as part of the Phase-I efforts of the NETL funded DOE Crosscutting Technology Research aimed at enhancing MFIX-DEM.